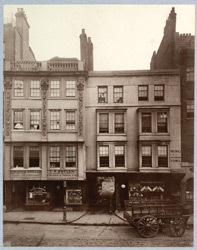 Photographer Henry Dixon recorded buildings of Victorian London, under threat of demolition for the Society for Photographing Relics of Old London. In the book 'Photographs of Old London' his images are accompanied by a descriptive letterpress provided by Alfred Marks. This photograph shows the remains of an old Inn 'The Saracen's Head', "destroyed for the extension of the Metropolitan Railway from Aldgate to Tower Hill."